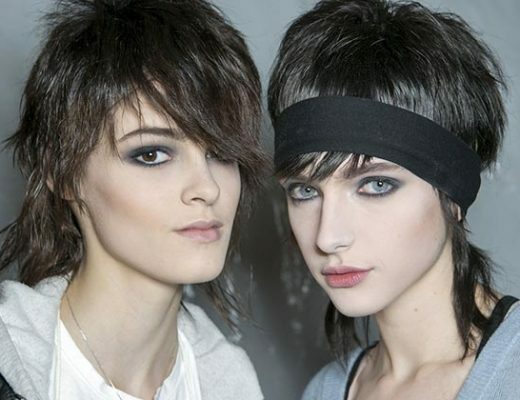 At Dsquared² A/W 2009, designers Dean and Dan Caten gave us a glam grunge/rock ‘n roll collection that is obviously targeted towards the young. Pieces included plaid shirts, preppy button-down shirts, slouchy cargo pants, miniskirts, boyfriend blazers, leather jackets and more. Plus models even strutted down the runway with huge shades, knit caps, a Starbucks coffee in hand, leather bags which are all so typical of what we see among the young Hollywood stars nowadays. Loves it! To go with the rock ‘n roll theme, Gordon Espinet from MAC created a dramatic glossy eye smudged in black, purple and blue with tons of mascara and just a bit of color on the lips.